I admit I was a bit hesitant to write this blogpost. 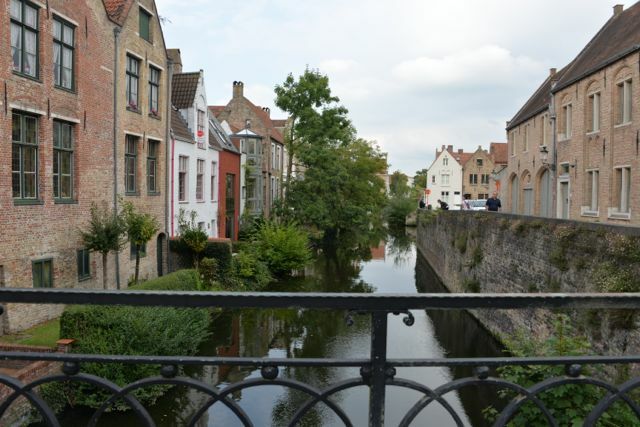 Many places in Bruges are still undiscovered by the masses, so could I tell others about them, or should I keep all the quiet hidden spots to the people living in Bruges? Then again I guess only the social, alternative traveller would read a blog to gather tourist information, so the chance that certain places in Bruges will suddenly be swarmed by tourist groups as a result of this post is rather small to non-existant. So I have decided to write about those beautiful places, but only if you as a reader promise to treat those places with respect, and not to act as obnoxious tourists when coming here. Deal? I am always surprised how 99% of the tourists follow the same small circular route through Bruges, fighting for some walking space with a million other tourists walking the same roads. Bruges is a real small city where you can get lost without really getting lost, inviting you to wander from the tourist grid. More and more tourist are also hiring bikes since Bruges is a very bikable city (apart from the cobble stones). Many tourists unfortunatley never really learned to drive a bike properly at home, making them a real danger on the road. Some are not even aware of the fact that you have to keep to the right hand side of the road in traffic. Locals often curse the inappropriate way tourists walk and bike around Bruges. Many young tourists and back-packers stay at The Bauhaus hostel, and here you can rent a bike even when not sleeping here. The Bauhaus is located close the the Kruispoort (one of the old city gates at the canal side), and conveniently located close to the windmills where you can start a great bike road around the city. 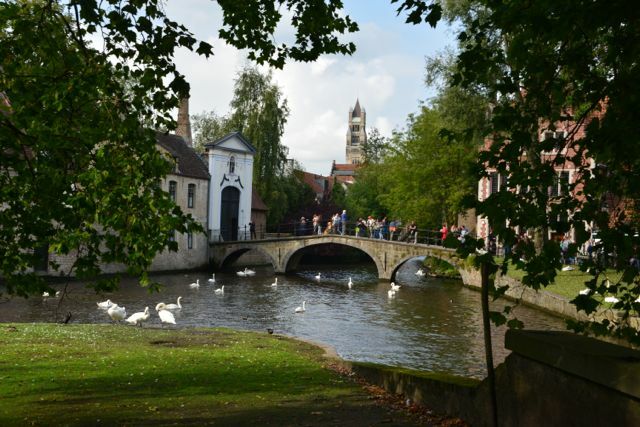 There are some great bike routes in Bruges: you can follow the circular route around Bruges and discover many beautiful places along the way. 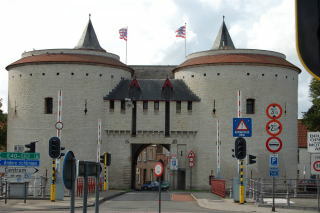 If you start from the Ketting, you get to the canal at the Ghentpoort (one of the city gates) The Ghentpoort is a gate that can be visited on the inside. Take the walking-biking route to the left, and follow the route parallel to the water. You first cross a little iron bridge, the Conzettbridge (that can be lifted if pleasure boats need to pass), and enjoy the little harbour on your left. 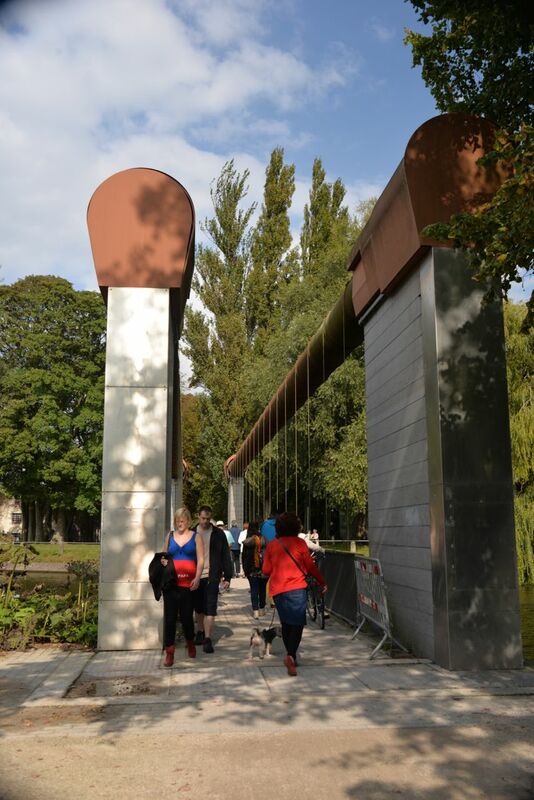 The bridge is designed by the Swiss architect Jurg Conzett. It is a very picturesque place, and you can see many of the towers of Bruges from here. Continuing the road goes a little uphill and then back down till you get to the next two bridges at the Kruispoort (next city gate). 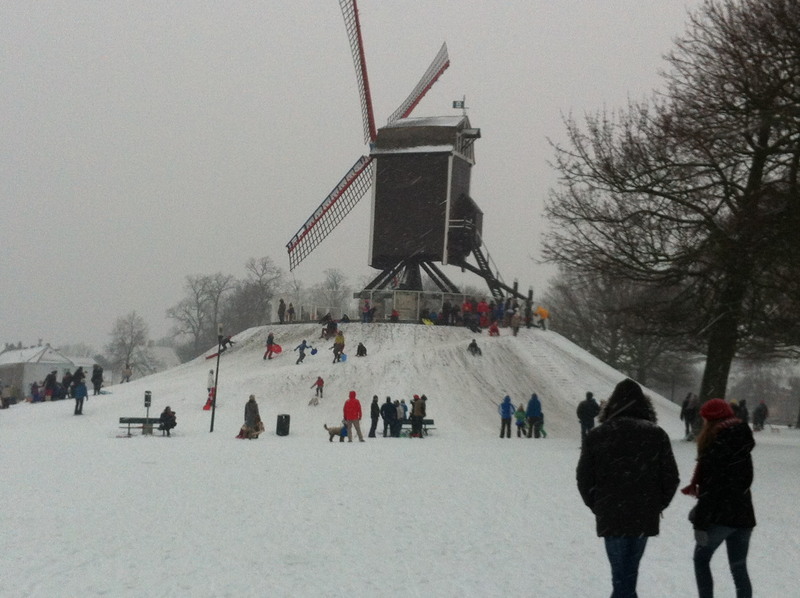 Climb the hills of the windmills and enjoy the view of the city from up here. In front of the first windmill you can see an area where people still practice archery. 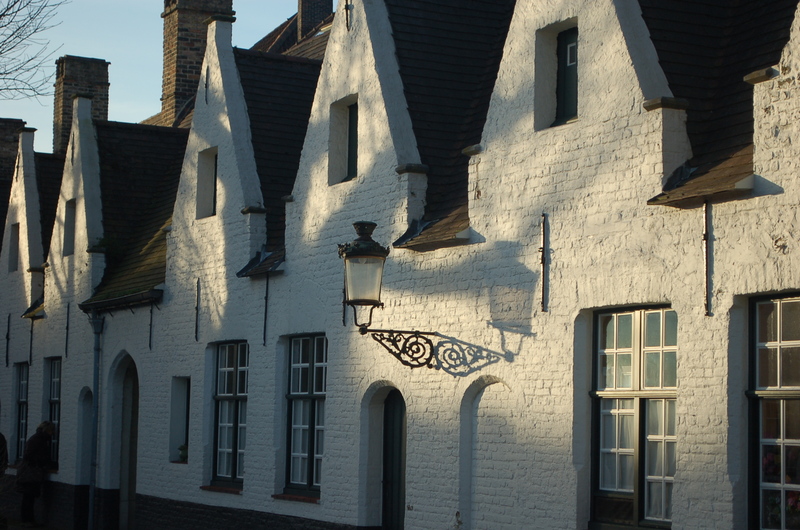 When you go into the street just in front of the second windmill (Rolweg) you can visit a small museum (nr 64) dedicated to one of the famous poets of Bruges (Guido Gezelle). Especially the garden is a beautiful place to rest and enjoy the peacefulness of the place. (entrance is free with a Bruges city card) As explained in one of my previous blogs, the areas around the windmills are great picnic spots! Continue further in the street (Rolweg), and on the corner of the second street to the left you find another small museum: Volkskundemuseum ( 4 euro or free with a Bruges city card), or the Museum of Folkore (Balstraat 43 ) inside several 17th century renovated one chamber houses where you can visit an old classroom, pharmacy, hat makers house, bakery, bedroom, and where you can take a drink at the tavern, or relax in the garden. Continue in the road left (in the Balstraat) and at the end of this street you will find a beautiful little church: The Jeruzalemchurch, which can be visited. Next to the church (Balstraat 16), you will find the completely renovated Museum of Lace. Lace is what Bruges used to be famous for, but is slowly disappearing. This museum and centre for Lace next to the church, tries to keep this old tradition of lace alive, teaching the technique to youngster and children as well as adults interested. (3 euro or free with a Bruges city card). Turn left at the Jeruzamenchurch and go back in the direction of the windmills. 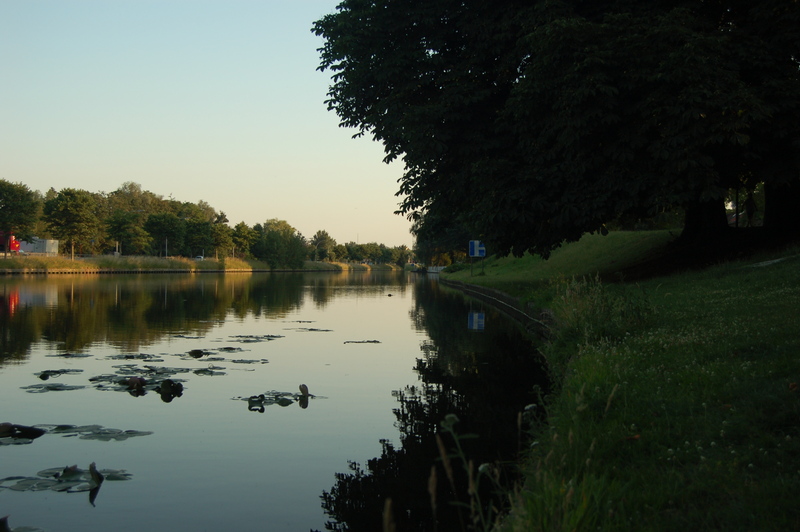 Continue the bike road parallel with the canal to the left and you will pass a third windmill on your left hand side. On your right you see some old barges that have been renovated into modern living places on the water. Continuing further you come to the next two bridges at the Dampoort ( where the old gates have disappeared). 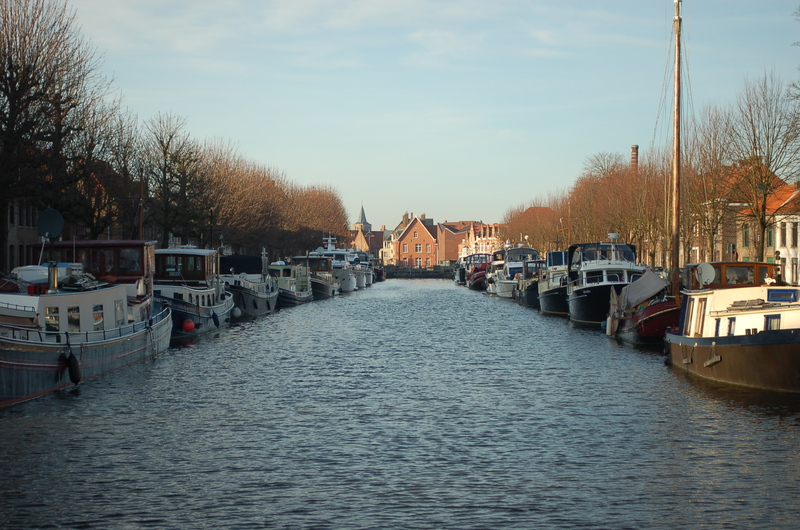 Here you can choose to take the biking route to Damme, a route I will describe in the next blogpost. Here we will stray a bit from the circular route itself, to avoid having to follow a busy road with little to see. We turn left to follow one of the canals, on a cobblestone road: Potterierei. On your left you pass the church and old hospital “Onze-Lieve-Vrouw-Ter-Potterie” which can be visited. (free with Bruges city card). You also pass het “Grootseminarie”, where new catholic priests are formed. On your right is a small old wooden bridge “Duinenbrug”, it used to be an iron bridge which has been replaced by a wooden bridge in the nineties. Follow the canal keeping the water on your right just to the farthest side where the canal intersects and also truns to the left. Before you cross the pedestrian bridge on your right, turn left into the small street: Blekersstraat. 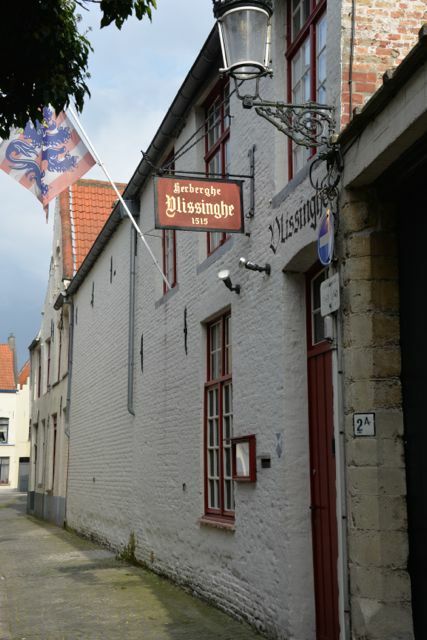 On your right you find the oldest tavern of Bruges: Herberg Vlissinghe. You can have a beer or if you are hungry you can eat something small. After your break, go back to the canal, cross the small pedestrian bridge at the end of the Blekersstraat, go straight and follow the canal in the Spinolarei till you reach the small square called Jan Van Eyckplein, and where the water dissapears underground. In the Middle Ages boats came into Bruges just up until this square, that acted as a small harbour to unload goods that would be sold a bit further in the “Beurs” (what would today be the stock market). Cross the square and turn left into the “Academiestraat”. (gaze at the mouth watering patisserie at bakery Academie, they also sell ice-cream if you are in need of a refreshment). 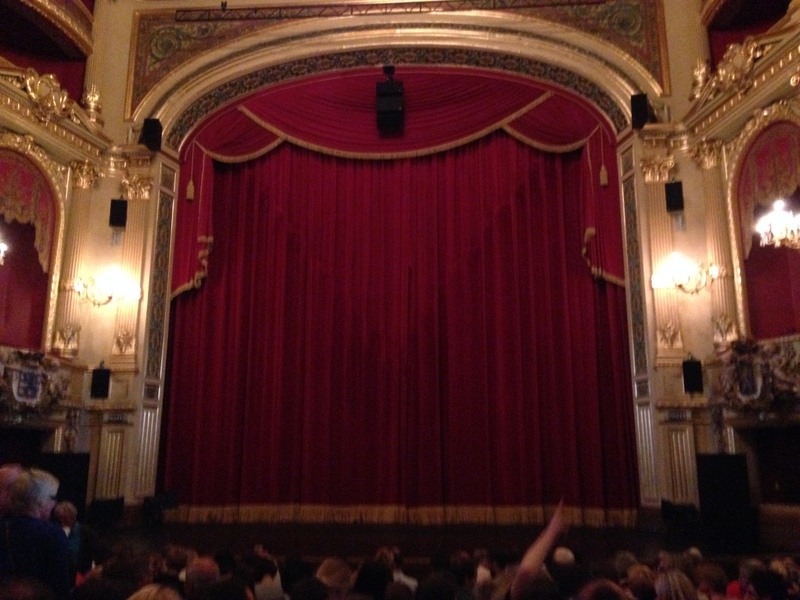 At the end you should turn right into the “Vlamingstraat”, but if you drive a few metres to the left, you see the small but beautiful city theatre. Turn right into the Vlamingstraat , cross the small bridge and immediately turn left into the small pedestrian street: Pottenmakersstraat. 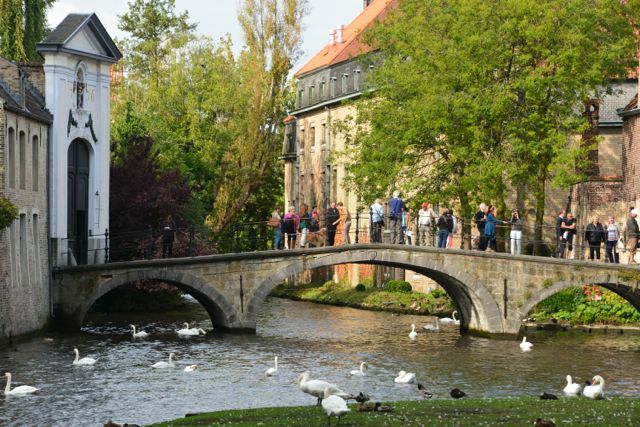 Enjoy the views on the many small bridges over the small canals, where beautiful houses and gardens border the water. At the end of the Pottenmakersstraat turn right into the Ezelstraat. You can visit the two churches in this street: The church and cloister of the Karmelieten at number 28 (built in 1688), entrance is free, and the small church on the small square a bit further on your right hand side which is the Theresiananchurch also called the English church. At the end of the street you join the circular road around Bruges, by crossing the street to view the Ezelpoort, one of the gates of Bruges, and continue your way on that side of the road on the comfortable bike road paralell to the water. Cross the big road at the end of the Gulden Vlieslaan, and continue your way on the bike road through the beautiful park. (parallel with the Hendrik Consiencestraat) Half way you pass the next gate: Smedenpoort. Continue further in the park on the left side of the water. A bit further at the other side of the road: Hendrik Consiencestraat 2-11 en 12-18, you see small (white) houses called godshouses, where the poor used to live, and that are now renovated as alternative living areas. At the end of the street, take the bike tunnel under the intersection, and you come back up just before the train station. Cross the street just after coming out of the tunnel. On your left you see the huge modern concertbuilding “Concertgebouw”. If you have the chance to see a concert here, the building has exceptional acoustics, that make any classic concert an special experience. After crossing the street go straight into the street: Oostmeers, and take the first small pedestrian street on your right that follows a small canal. At the end you see a small tower where they used to keep the gunpowder. Enjoy the view from the small bridge. Turn left just before the bridge and enjoy the lake of love! You can also cross the bridge and take on your left the walkway down into the “Minnewater” parc. 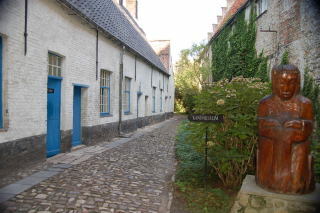 Both ways end up at the beguinage, at the small square (Walplein) where the horse carriages take a rest. In the water many swans roam, a famous sight in Bruges. 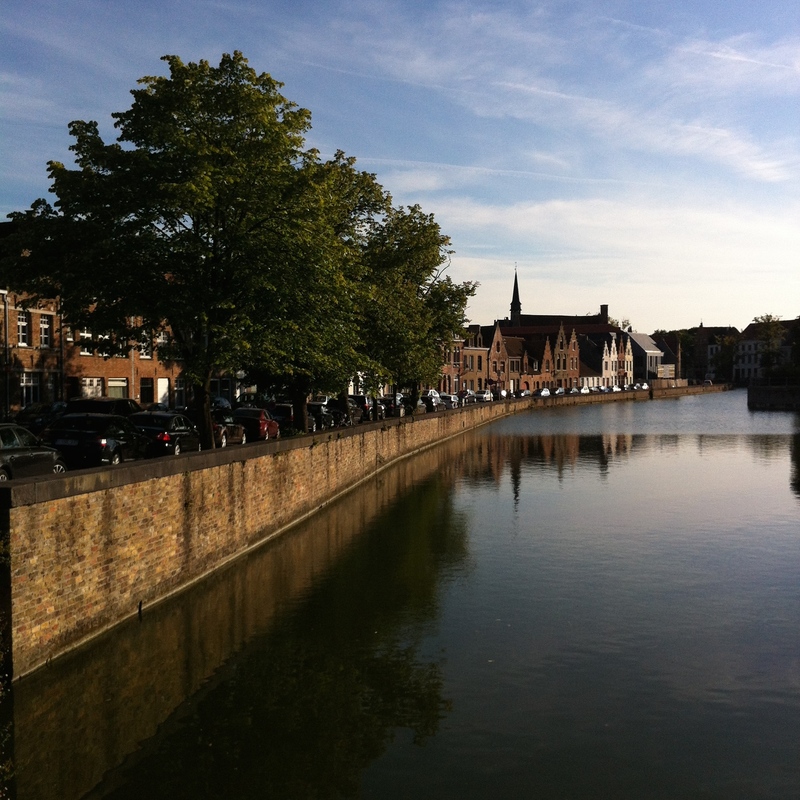 Cross the small bridge into the beguinage, where nuns still live. You sometimes see them crossing the inside square. Visitors are asked to keep quiet. 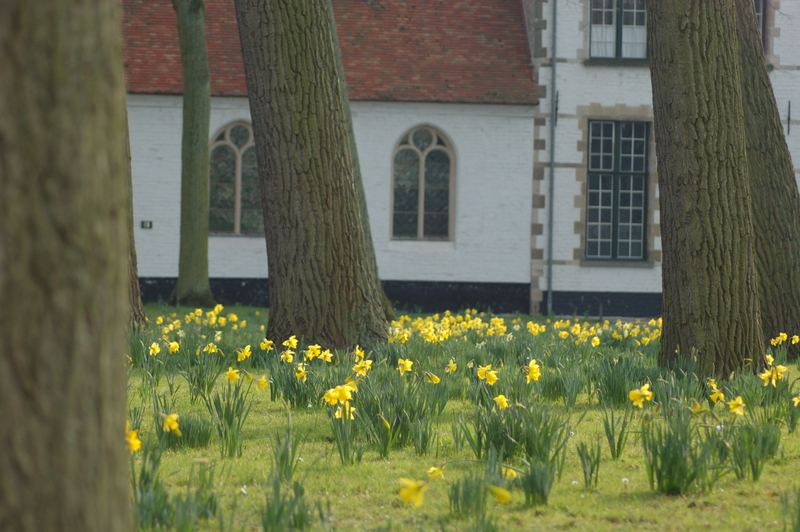 In spring the grass courtyard is filled with yellow easter flowers. « My,my, I am a Social Traveller!